WHAT ARE SEGMENTS? WHERE SHOULD I USE THEM? Segments are manufactured from flat plate and pressed into shape. They can be made out of a variety of metals including stainless and bisalloy, making them ideal for special situations such as where there is a lot of abrasion involved. 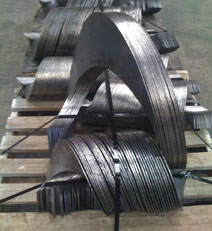 You will often see segments at the pickup end of augers as this is the zone of most wear. Sectional flighting is also used commonly in Screw Piles and Ground anchors, as well as earth augers and post-hole diggers. Segments are “one-turn” pieces covering basically one pitch in length. They are snapped sideways onto the shaft (not fed in from an end) and are then welded together to form whatever length of flighting needed. Our Australian Made segments generally cover more than one pitch or 360° revolution of the shaft. This is an added bonus for the customer as you will tend to require a lesser quantity and the segments stay nice and snug on the shaft after you snap them on, helping you to fit them easily. Imported segments are normally made to only 360° or one pitch exact. You can feed these onto the shaft from the end or place them on from the side, but unless you have four hands, as soon as you let go of them they fall off the shaft! 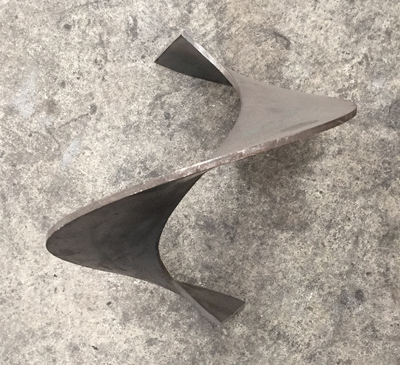 Unlike continuous flighting segments are uniform in thickness and can be made to virtually any specification. WHAT QUANTITY CAN I PURCHASE? As segments are made to order, you can purchase any quantity but there may be a minimum fee charged due to the set up time for cutting and pressing. Please allow two to three weeks for delivery of segments ordered in. We do carry in stock a range of the more common segment sizes, but mostly you should expect to have to order in what you require. WHAT MATERIAL CAN MY SEGMENTS BE MADE OUT OF? 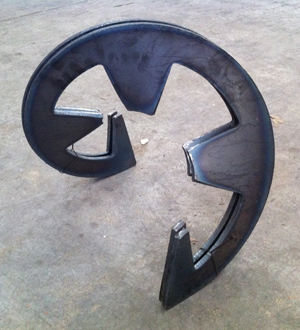 We can have segments manufactured from most materials available. Mild steels, Stainless Steels, Bisplate or Hardox are the most popular materials to manufacture segments from. Other materials can pose problems in the forming process but we will inform you of this when we give you a quote. Unless you specify otherwise, your segments will be quoted for and manufactured out of mild steel. WHAT TYPE OF SEGMENTED FLIGHTING CAN I ORDER? There are several different styles of sectional flighting available. Other than full faced flights, we find Ribbon Flights with integral support legs to be the next most popular choice in agricultural conveying. 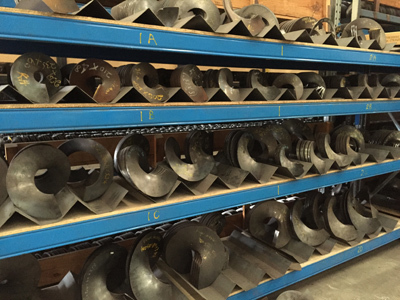 We also source tapered or coned flights, screw pile and ground anchor flights, notched flights, vane paddles, wear shoes and wear plates. WHAT SIZE CAN I MAKE MY SEGMENTS? 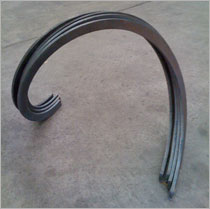 Segments can be made as small as 30mm and as large as a couple of metres in Outer Diameter. There are some specific correlations between the size of the pitch and the centre bore, but this varies dependant on material and size. Best thing to do is to contact us with what you would like to have manufactured and we will tell you if we can do it! Each of the manufacturers we work with have a production tolerance on OD, Pitch and alignment of Segments. If tolerances are important for your job please ask us for these details when we are quoting. HOW DO I FIT SEGMENTS? Segments are more labour intensive to mount on the shaft compared to continuous flighting but they are relatively easy to fit. Well made segments will be a snap fit onto the shaft, the ends will align one with another and labour costs to mount will be at a minimum. ‘’Not so’ well made segments can be very labour intensive to mount. We fit a lot of segments ourselves so we tend to be a bit fussy with our suppliers and insist on the best quality possible. HOW DO I ORDER SEGMENTS? The exact Outer diameter of the shaft the flighting will be mounted on. The flighting thickness required on the outer edge.